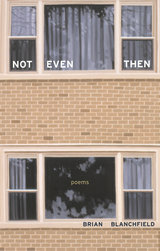 Not Even Then, the debut collection by Brian Blanchfield, introduces a poetry both compressed and musically fluid, beseechingly intimate and oddly authoritative. Blanchfield conducts readers through a unique, theatrical realm where concepts and personages are enlivened into action: Continuity, Coincidence, Symmetry, and Shame keep uneasy company there with Marcel Duchamp and Johnny Weissmuller, Lord Alfred Douglas and "Blue Boy" Master Lambton, Juliet’s Nurse and Althusser’s Moses. With its kinked and suspensive language, Not Even Then draws on the lyric tradition, even as it complicates that tradition’s dualism of self and other. Likeness is always under investigation in the book’s irreducible arrangements of alterity. From "Red Habits": "I imagine the interferences explained / in don’t-think-twice and reverse advice / and by habits for both head and breast / hers and hers as red as mine at chamber check. / We are each herself a further interference." No answer rests unquestioned in its turn; even the book title’s cynicism is challenged by a poetics alive to possibility, where Possibility is—impetuously, ecstatically—companionable. "The listener you are," writes Blanchfield, "the less alone." Brian Blanchfield teaches in the B.F.A. creative writing program at Pratt Institute of Art. His poems have appeared in such publications as Fence, Ploughshares, Slope, and Volt. He lives in Brooklyn, New York.